Living optimism invites us to reach higher and become the fullest expression of our intentions. When we’re passionate about something, we have a positive attitude and embrace each day with a new outlook. Honor your calling, your life’s true purpose. This way you find happiness and success. The sustained practice of meditation is a staple of a balanced lifestyle. It’s not selfish to want a happy, harmonious life. It’s your birthright, and the true foundation for optimal mental, physical, and spiritual wellbeing. 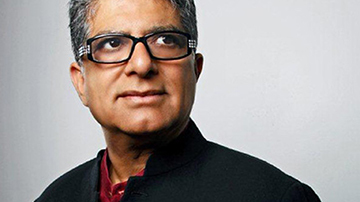 Deepak Chopra (born October 22, 1947) is an American bestselling author and public speaker. He is a prominent alternative medicine advocate and a promoter of increasingly popular forms of spirituality, for instance having been described in the New York Times as a “controversial New-Age guru”. Through his books and videos, he has become one of the best-known and wealthiest figures in the holistic-health movement.